The process of writing a perfect text is an exhausting task which involves a lot of rewriting and editing. To help you with this tedious task WhiteSmoke Editing Software comes into the picture. WhiteSmoke Editing Tool consists of a grammar checker, a spell checker and a punctuation tool which will all function as your private human editor. WhiteSmoke Editing Software is based on natural language processing and therefore provides accurate and comprehensive corrections in the field of English Grammar, spelling and punctuation. 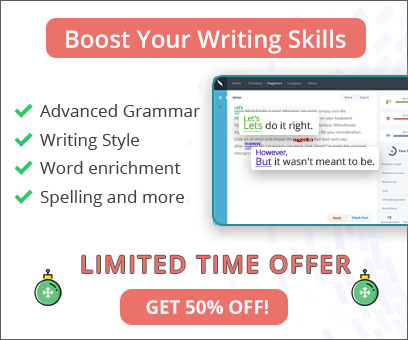 This package will ensure you will not have to waste your time and energy going over your text again and again for editing. 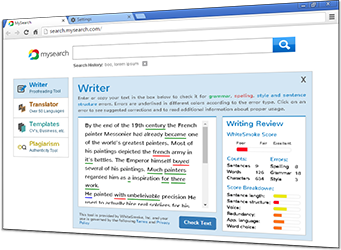 Instant analysis - With only one click, WhiteSmoke will enrich your text and correct your grammar and spelling as a good editor would. Automatic Correction - When checking your text you can choose the auto-check button for WhiteSmoke to correct your grammar, spelling and punctuation mistakes automatically. User Friendly - WhiteSmoke Editing Software is an easy to use tool, which works on any application. Try our online editing tool for free today, and assess the quality for yourself. WhiteSmoke Editing Software is the key to all your writing endeavors. The fact that WhiteSmoke Editing Tool consists of a proofreading software and a writing tool will ensure that your text will be written in the best way possible to convey your message clearly.